From “The Salty Tale of Noah and the Ark” to “The Lasting Story of the Last Supper,” the rhyming tales in Treasury of Bible Stories remind us God loves his people — in the Bible and today. Not even mom or dad will grow tired of reading its pages night after night . . . after night. The book is the fourth installment in David C Cook’s Magnificent Tales series, which includes the three previously released stories. Treasury of Bible Stories contains the most beloved biblical narratives from both the Old and New Testaments, leading up to Christ’s death and resurrection. Pulley chose key stories with the strongest spiritual lessons and images that would jump off the pages. Filled with clever cadence, captivating art and clear spiritual lessons, Treasury of Bible Stories will quickly become a reader’s beloved family tradition. Kelly Pulley was born in Wabash, Indiana, a small and quaint Midwestern town surrounded by miles upon miles of corn and soybean fields. It was an ideal place to grow up with my three older brothers and younger sister during the 1960s-70s. When we weren't in school we were free to ride our bikes as far as we liked, exploring the Indiana countryside to our heart's content, as long as we were home for supper. I began drawing and doing crafts at an early age under the guidance of my artistically gifted mother. Besides giving us lessons in art, she did all the other things a mother should do as well as being our scout den mother and working part time jobs while we were in school. Now in her 80's, she still enjoys painting. My dad, ex-WWII bomber pilot, fireman and electrician, worked multiple jobs to keep us all in new Red Ball Jets. In 1995, I moved to Tennessee to illustrate The Beginner's Bible series of books for Performance Unlimited, and later Mission City Press. During this time I designed various products for the Beginner's Bible series including: bedding, puppets, dinnerware, toys and figurines. I also illustrated dozens of books, most notably the best-selling latest edition of the Beginner's Bible, which has sold more than 1.5 million copies. 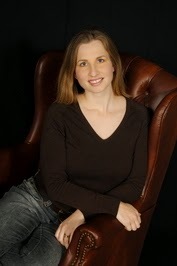 My authorial debut was, Ten Unusual Features of Lulu McDunn, which was released in August 2010. 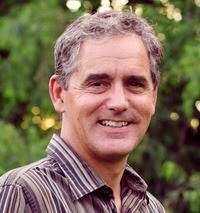 My second book, The Cycling Wangdoos, was released in August 2011. October, 2012 was the release date for Food for a Fish and Good News of Great Joy, the first two books in the Magnificent Tales series of Bible stories by David C. Cook. Then in February, 2013 two more titles: The Biggest and Toughest and Daniel for Lunch, were also released. 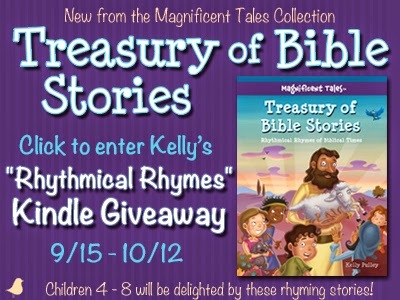 In November, 2014 a 20 story storybook– Magnificent Tales, Treasury of Bible Stories (Rhythmical Rhymes from Biblical Times) will be available. I feel very humbled and blessed to wake up everyday to a job that I love, and be able to serve my Lord, Jesus Christ, with the talents he’s given me. 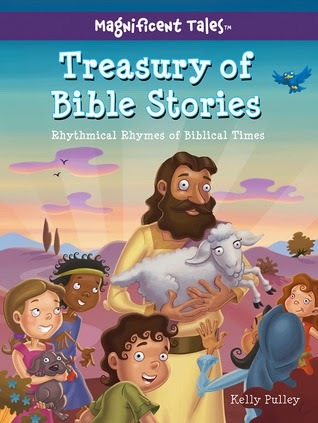 Treasury of Bible Stories Rhythmical Rhymes of Biblical Times by Kelly Pulley is a must have book for your children’s book collection. Because the well-known Bible stories are told in rhyme my boy’s attention was grabbed immediately. The book is well illustrated with beautiful eye grabbing gorgeous colors. With 351 pages, and a hard cover to make it a sturdy one for little hands. We keep it by his bedside, and is the first book requested each night. A cute and accurate way to bring bible stories to life for little ones and the rest of the family, the boys can’t wait to have their story each night and have shown a lot of anticipation. Even our 9 year old is excited by the story told in great way, and they giggle and enjoy the illustrations. A quote from the back of this book that is so true, “From “The Salty Tale of Noah’s Ark” to “The Lasting Story of the Last Supper,” the rhyming tales in this book remind us that God loves his people!” Amen! This hop is meant to feature a book you love but doesn't get as much attention as it deserves. My book is actually three books, they are awesome and linger for a long long time. Lynn Austin's Refiner Fire!These are probably the best books I have read, and I read a lot. I'll bet you have the same kind of book or books that you want to share or read. 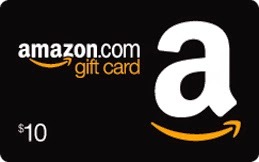 My giveaway is a $10 Amazon Gift Certificate that you can use to get that book! Just fill out the attached Rafflecopter! Good Luck! Suzanne Woods Fisher lives with her family in the San Francisco Bay Area. She has one husband, four children, one son-in-law, a two-year old grandson who makes everybody laugh, another little grandbaby on the way (due on Christmas eve!) and raises puppies for Guide Dogs for the Blind. So happy to be back at Rose Hill Farm and at Christmas time, visiting with old friends, and back in familiar surroundings. 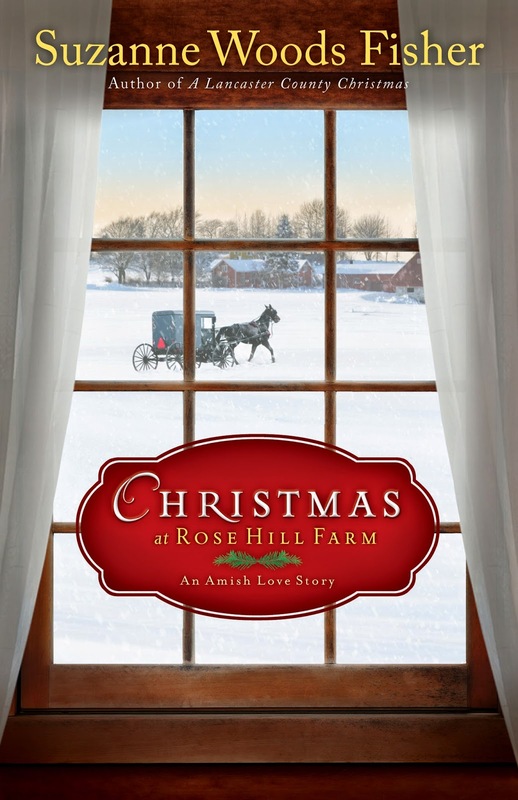 Bess is still helping on the beloved Rose Farm, along with her Dad, and she is planning her wedding to Amos. This story revolves around a mysterious, and possibly rare and very valuable rose, which has been found, about to bloom in the greenhouse. Where had it come from, that is going to be the question that brings back a lost soul to the Amish community? Once Billy Lapp comes back to see the rose, acting as a Rose Rustler for Penn State, the world begins to change for Beth. Will they be able to discover the origins of this rose, and will old feeling come to climax? There are a few really good chuckles in this story, and a lot of serious actions that are unaccounted for. We go back into the past for some of the answers, and feel the pain Billy has endured that emanates from his family. I don’t know if there is another book that will answers more of these questions, but Billy ends up with a big assignment from his Dad. We see that couples that think they belong together, might be better off with someone else, while some that are together don’t really know one another. We also have some very sweet and precocious children, they are Beth’s sisters, how darling they are, and they say it like it is! This is a really great page-turning read, with some really good life lessons, I enjoyed this one! 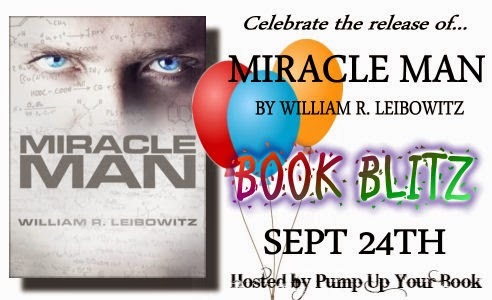 Pump Up Your Book is pleased to bring you Jim Greene’s Unlocking Your Spiritual Greatness Book Blitz September 2 – 26! This giveaway begins September 2 and ends on September 26, 2014. Winner will be contacted via email on October 1, 2014. Pump Up Your Book is pleased to bring you Alistair McGuiness’ Round the Bend virtual book tour September 2-26! It s a good thing Conrad brought his Mega Ultimate Extreme First Aid Kit to Uncle Clint s ranch because learning how to be a cowboy turns out to be a lot harder and more painful than he thought. Conrad has a lot to learn including don t squat with spurs on and never wave your red sweatshirt at a bull. But the biggest challenge of all is dealing with Imogene Louise Lathrup, the know-it-all-cowgirl next door. When Imogene shows up, she is all too happy to point out Conrad s shortcomings. In this follow-up to their debut hit Pirates on the Farm, author Denette Fretz and illustrator Gene Barretta team up once again to tell a humorous tale about what it means to love your neighbor. Gene Barretta is the author and illustrator of Now & Ben: The Modern Inventions of Benjamin Franklin and Neo Leo: The Ageless Ideas of Leonardo da Vinci. He is also author and illustrator of Dear Deer, which was a Notable Children’s Book in the Language Arts and listed on the Parenting Magazine Mom-Tested Books of the Year List. He holds a B.F.A. 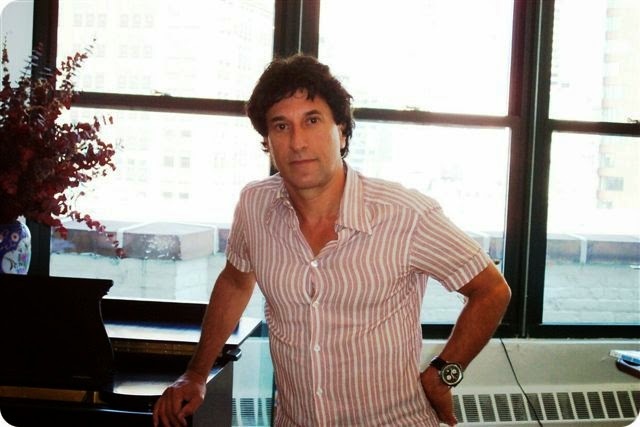 in Film Studies from New York University, and has worked for many years in film and television production. He lives in Wynnewood, Pennsylvania with his wife and son. When I read this book with my 8 year old, I knew from experience what was coming; Conrad had better out smart that girl next door. He began giggling looking at the front picture of Conrad being dragged by a pig. What a great way to draw children in, and the bright colors were a great add. 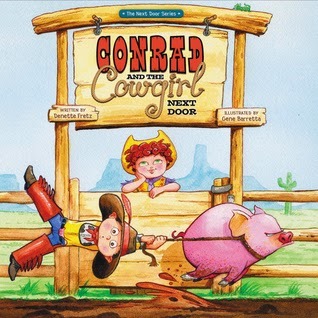 A delightful story, and my boy loved it, and he was laughing at some of the antics to become a cowboy. He enjoyed that Conrad had that Mega Ultimate Extreme everything. He was hysterical at adding a little bit of hot sauce, or should we say mega amount! There are some great lessons here, and the main one being forgive your enemies. What a great directive for everyone. He had a great time with the poems at the end, and wanted to go back over the story and the delightful illustrations. What a great book to add to your children’s collection! I received this book from the Publisher Zonderkidz and was not required to give a positive review. Pump Up Your Book is pleased to bring you Lauren Carr’s REAL MURDER virtual book tour September 2 – 26! Real Murder is available at Amazon. 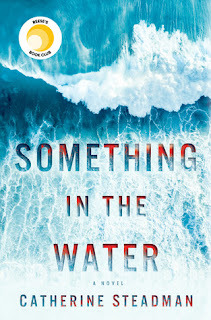 Lauren launched the Lovers in Crime (first introduced in Shades of Murder) mystery series in September 2012 with Dead on Ice. Real Murder is the second installment in this series. More books by Lauren Carr. Yes another Giveaway Hop, and here is how you can win! Fill out the rafflecopter below, easy huh? I love, love, love books, and I want you to be able to choose the one you want! This one is hosted by I’m a Reader, Not a Writer and Stuck in Books. There are over 150 blogs participating....check them out here. 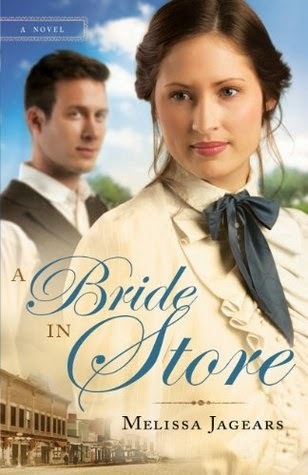 Mail-order bride Eliza Cantrell is on her way to meet her intended groom and help him grow his general store business when her train is held up by robbers and she loses her dowry. She's further thwarted upon arriving in Salt Flatts only to find Axel, her groom, away on business. 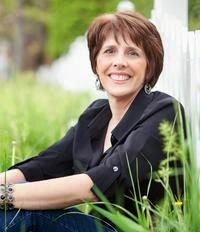 Melissa Jagears is a homeschooling mom who writes Christian Historical Romance after everyone is asleep. 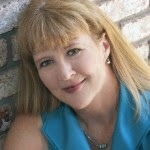 She’s the author of the Unexpected Brides Series with Bethany House. The prequel ebook novella, Love by the Letter is free to try. A Bride for Keeps and A Bride in Store should be available wherever books are sold. What a chance of circumstances Eliza has that makes her end up early in a town far from home. She ends up there early, and as she is a mail order bride, her groom to be is not there to meet her. Not only that he is anywhere to be found, now what? This poor girl not only does not know where her future husband is, but also is robbed of her dowry on the train to Kansas. Can’t imagine how this poor girl managed, yes she is very smart, but could see the hand of God in all that proceeds to happen. 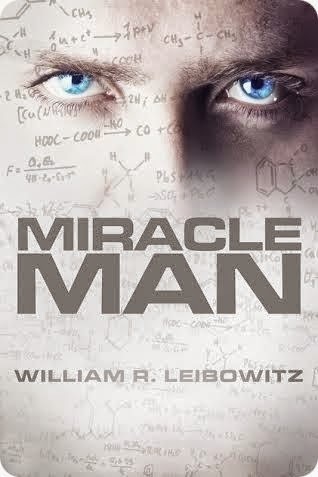 I really enjoyed this story and how things all worked out, not always how you hope, or expect. Come along and enjoy this rather spunky young woman, and see if she gets the chance of a lifetime, and her dream fulfilled. Then there is her fiancé’s partner, who takes her under his wing, and he has his own demons. William is a doctor without a degree, and is really not paid for his services, even though he has helped many. I loved being in this early American town. You won’t be able to put this one down until you find out how all of the answers. Pump Up Your Book is pleased to bring you Paul DeBlassie III’s The Unholy virtual book tour June 2 – August 29!